Western Hills Elementary School opened in the Fall of 1968 on land donated by William C. Childers, T. C. Whitley, and representatives of the Sparta estate. Constructed in the lush Western Hills development, this neighborhood school provided a safe and caring environment for the children of families attracted to the thriving new community. A quality staff and superior parent involvement helped facilitate the school district’s first centralized library at the school in 1973. The successful effort motivated other schools across the district to raise funds for their own libraries. Kindergarten was added to the school in 1975. Over the years, the school has grown from a small one-wing facility with six grades and six classrooms to an expansive campus with over twenty-five classrooms, a computer lab and an on-site gymnasium serving the needs of over 440 children each day. The school has twice earned an “Exemplary” rating from the Texas Education Agency and maintained a “Recognized” rating consistently from 2006-2010. As the needs of our students and families continue to change, Western Hills Elementary is committed to providing the type of high-quality environment where every child gets a chance to shine. Rigorous, engaging instruction, state-of-the-art technology set within a culture of high expectations will compel our students to be creative, confident, and ready to bridge the values of the past to a vision for the future. 4th grade students will take the STAAR writing assessment on Tuesday April 9th. 5th grade students will take the STAAR math test on Tuesday April 9th and the STAAR reading test on Wednesday April 10th. The state mandates that 5th grade students pass the reading and math test in order to progress to the 6th grade. We are collecting pennies for patients! This fundraiser benefits the Leukemia and Lymphoma Society. The campaign will run from February 4th – 22nd. Students may collect any coins or bills, it does not have to be just pennies. Students can collect money using their boxes and then bring the money to their homeroom to deposit in their homeroom box. The flyer also explains how students can create a donation page online to be able to earn prizes. As a campus, we will be competing by houses.If we collect at least $750. as a campus, we will be awarded with an Olive Garden lunch for 35. This means, whichever house collects the most money will have an opportunity to win the lunch. I will put the homerooms belonging to the winning house and draw one out to select the winner of the lunch. We will also be able to feed any of the adults on campus belonging to that house, so adults – make sure you donate to your house! 100 Days of Freedom to Learn! We will celebrate the 100th day of school on Wednesday February 6th. 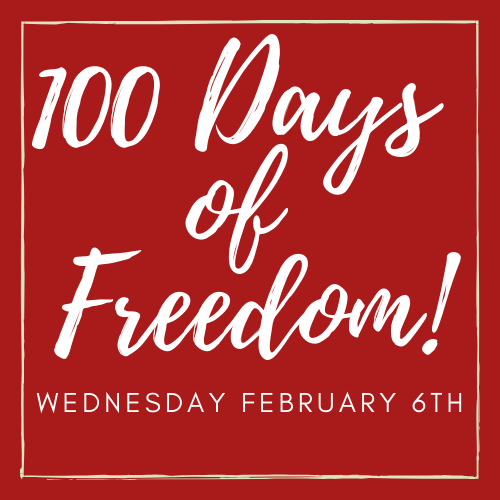 The theme will be "100 Days of Freedom to Learn!" Students in grades K-2 will march in a short parade and students in grades 3-5 will serve as spectators. Feel free to wear red, white, and blue attire to help celebrate the occasion!